designed and illustrated by Andrew Yelenak. painting. He photographed the area and produced a color sketch to establish his composition. Click on the sketch to see a larger view. The fall foliage on the State Capitol grounds and in Bushnell Park will make a colorful backdrop for the scene. The gold Capitol dome will be a dramatic focal point. Race director Beth Shluger reviewed the sketch with Andy and a few changes were necessary. to more accurately portray the scene, and the Governor's Footguard were added to the crowd of spectators. 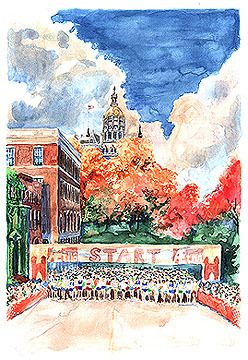 Additionally, the banner in the sketch was changed to match the real starting line banner, which was new for this year. the base-drawing is shown here. The pencil drawing was then erased. The posters measure 18" x 24" and sell for $14.00. 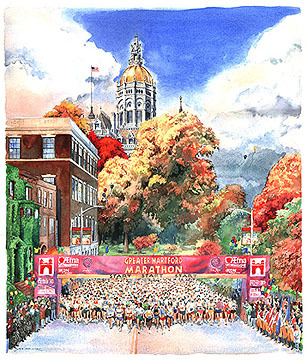 The poster was printed by Finlay Printing of Bloomfield, Connecticut.